When Adidas shocked the boot world by replacing the F50, Predator, 11pro, and Nitrocharge with just two boots the X and the Ace, I was left curious. We all know that the X was designed as a sort of like for like replacement in the speed boot category, and the Ace designed as a control boot replacement for the Predator. 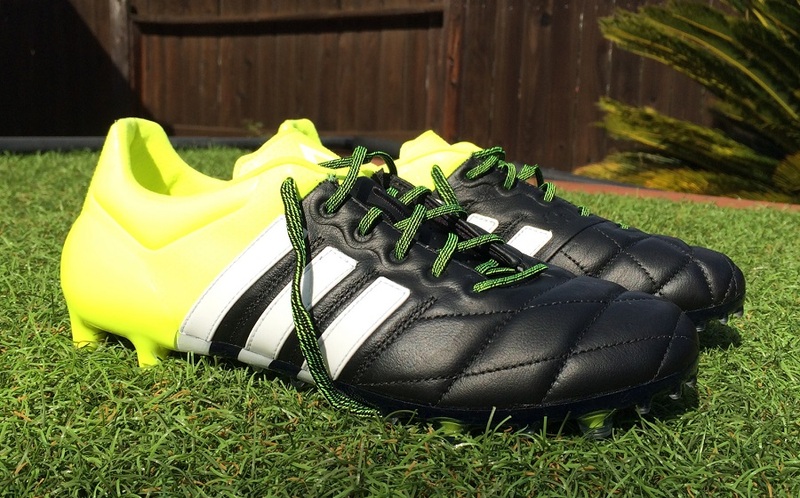 Now whereas for many the Nitrocharge was the red headed stepchild of the Adidas boot family, it did seem harsh that Adidas were cutting the 11pro a boot which had a following among players. Philipp Lahm, to name just one World Class example. 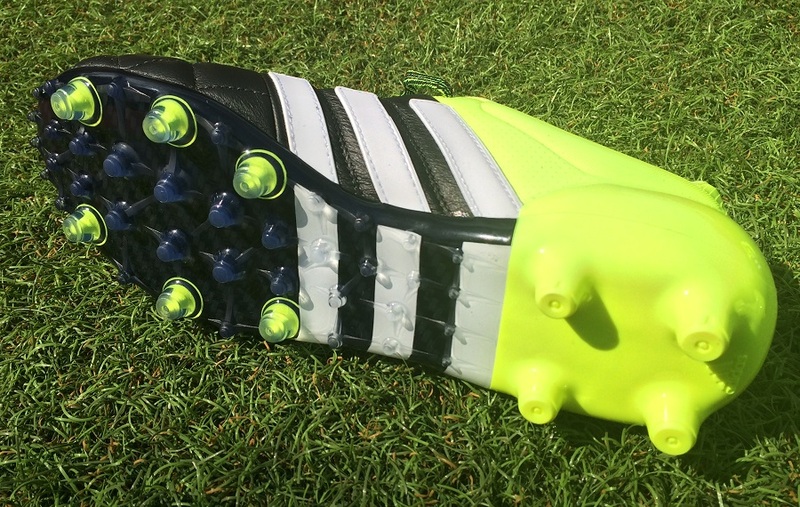 Where do players who value comfort and Kangaroo Leather fall in Adidas’ new chaos and control mainframe? The Gloro is a boot that initially ticks a lot of boxes considering it’s construction and it is designed for players who value comfort. That being said there’s no way that Adidas would allow their top names to wear a boot designed to be a top quality bargain boot, no matter how well it performs or how comfortable it is. 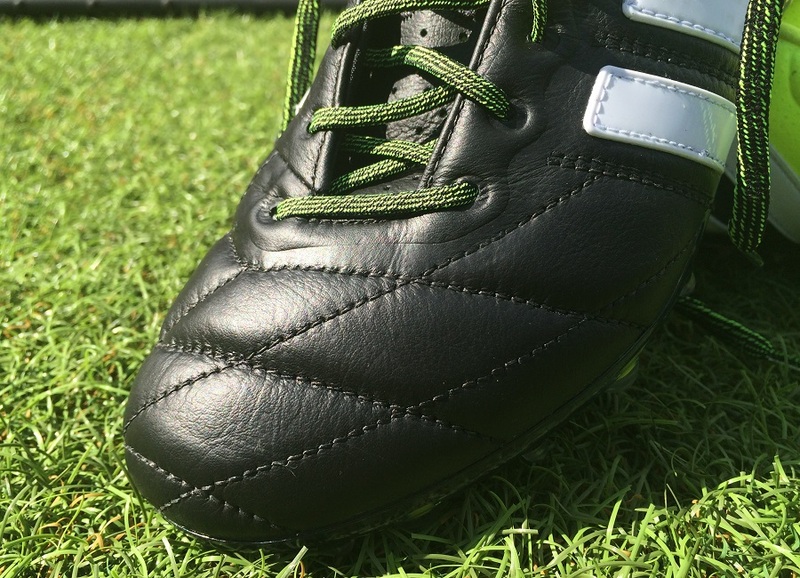 However, is the Ace 15 Leather the answer for the player looking for a comfortable but technical top tier boot? That’s the question I’ve been looking into in the last 8 weeks of testing out Adidas’s newest Kangaroo Leather boot in it’s release Black/White/Solar Yellow colorway. After the shock of Adidas replacing their entire line of boots wore off I sent a message out to Bryan asking him his thoughts on the 3 silos (Messi’s individual boots included) and five top tier Adidas releases, since he had them in the flesh and I hadn’t seen them in person yet. The reply I got back, “Ace 15 (authors note: Predator replacement Ace 15) is probably the most interesting, also the Ace Leather has your name on it, quite literally, I need you to find some time to put them through their paces.” Having very much become the curmudgeonly old man of the SC101 team the Ace 15 Leather is definitely the boot I was most excited for. Visually the Ace Leather is a bit of a dogs breakfast, which is to say it isn’t the prettiest looking boot ever released. While the K-Leather upper has a luxurious and padded feel about it, it seemed somewhat wasted when you consider it’s tacked onto a shiny and pimply (no other word to describe it really) synthetic rear portion of the boot. While I’m sure there are some people who’ll be in love with the look of the Ace Leather I definitely think it’d be a classier looking offering it if was all leather offering, or if the synthetic portion didn’t resemble pimpled patent leather. But hey, if the boot does the business on the pitch, I can get over the fact that it’s got a look only a mother (or designer) could love. You can find the entire Adidas Ace range at soccer.com. While not being as tech heavy as the Totalskin version of the Ace 15.1, the Leather version does feature a couple of the innovations from it’s synthetic sibling. Obviously the biggest is the FG/AG soleplate, which is designed to give you optimal stability and traction on both surfaces by lowering the ride height of the boot and including a whole slew of smaller studs. 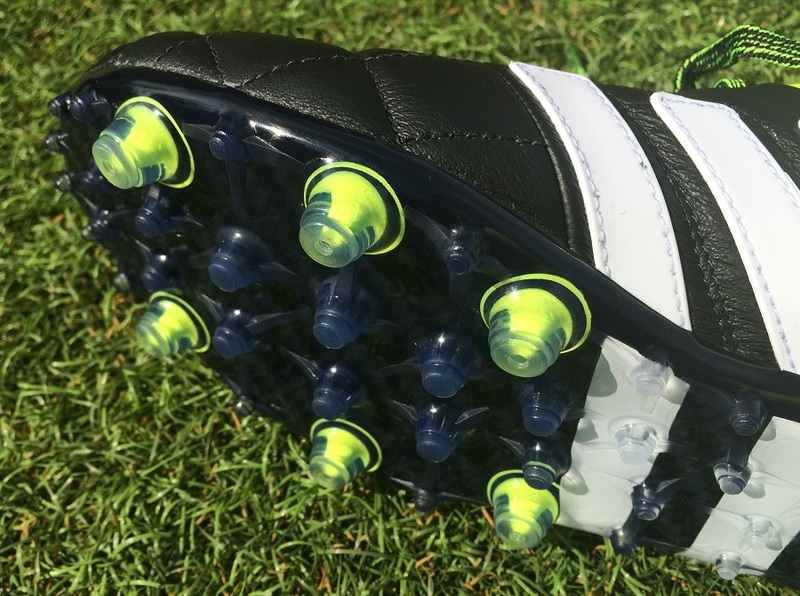 These smaller studs are also designed to aid in ball control, giving the wearer more contact with the ball when manipulating the ball with the sole of the foot, it’s arguably the biggest innovation in that area since Ronaldinho requested the studs on his personalized R10 boots had a specific pattern on their bottom to improve ball control. Also on the technology side is the addition of Adidas’ new pattented Non-Stop Grip (NSG) formula. While the synthetic version of the Ace sees the NSG applied to the webbing at the forefoot of the boot, the Ace Leather sees the coating applied right where you wouldn’t expected it, the rear of the boot. The NSG seems to need a synthetic material, as opposed to Nike’s All Conditions Control which features across their entire range of boots. But going back to where the NSG is located on this version of the Ace, unless you’re the king (or queen) of the backheel, or prone to controlling the ball on the inside of the heel of your foot, it’s very much an aesthetic inclusion, as opposed to a improving inclusion. Which when you consider the aesthetics of the Ace to begin with makes you wonder, why? The pair of Ace Leather’s I received in from Bryan came in the customary size 9 US. As it pertains to the fit of the boot they fit true to size length wise with the Kangaroo Leather upper allowing for some stretch. Width wise the Ace is a very forgiving boot so if you happen to be a bit wider of foot you’re in luck as the Ace Leather will definitely offer a bit of stretch in the directions you need it to. As for a breaking in period, the new soleplate on the Ace is flexible from the off, but I’m going to recommend taking out for a jog or two before you throw it into a match for the first time. My first time wearing the Ace Leather was in a rec game and I ended up switching out of them after about 45 minutes due to some foot cramping, and while I don’t expect this issue will befall everyone who laces up a pair of the boots for the first time, it’s better to be safe than sorry. When you’re talking about a K-Leather offering, the quality of the leather is paramount. The Ace Leather doesn’t let you down, it’s a super soft upper which features quilted stitching across the forefoot. The result on the inside of the forefoot kind of reminded of of the pod design of the original Nitrocharge 1.0, although instead of being there for added protection, they were there to allow for a pillowy soft touch on the ball. 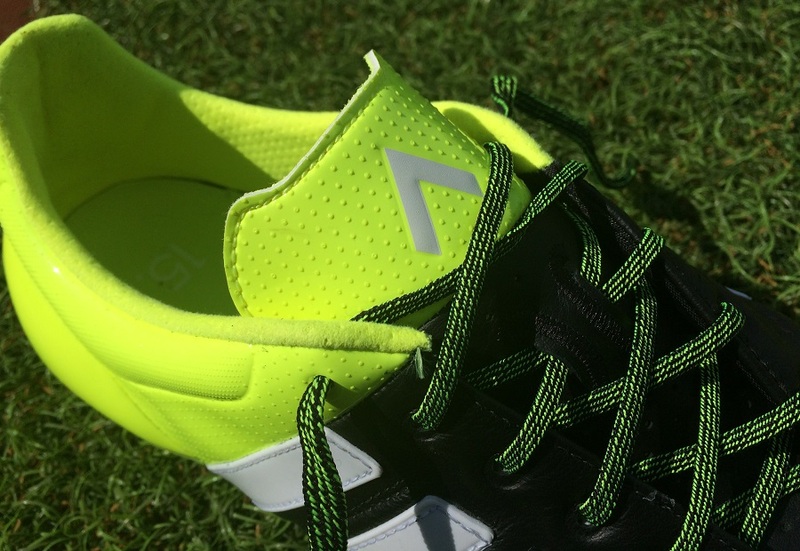 The Ace Leather also features a slightly off centre lacing system which allows for an enlarged strikezone. When you combine this with the quilted leather it offers a quality strike on the ball. It’s also something which allows for top notch feel when passing the ball and when receiving passes. I can’t stress highly enough how good the leather on the Ace Leather actually feels on the ball, you have enough padding to feel protected, but it’s thin enough to not take away from the touch at all. I don’t want to say that it reminds me of the Copa Mundial, as they’re both designed to be very different boots, but it’s the closest boot produced by Adidas to compare it to. Traction wise the brand new Totalcontrol FG/AG system does exactly what it says on the tin, gives you total control on FG and AG surfaces. When Adidas first released the dual surface stud pattern I was very skeptical, however, having chopped and changed them from FG to AG to FG again trying to see if they play better on one surface or the other, Adidas have hit this one spot on. For me comfort of the ride is usually where FG specific boots drop off a bit when on turf, but with the new FG/AG system the boot was equally comfortable on both surfaces. 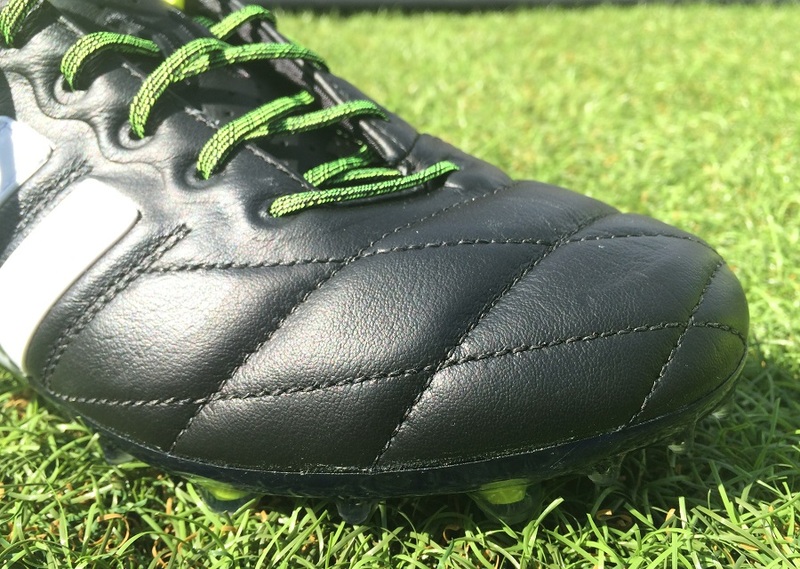 The other party piece of the Totalcontrol system is that the increased number of studs on the boot allow for better underfoot control of the ball. The theory behind this is brilliant as it enables the player to feint passes to throw off defenders, and engage in all kinds of other trickery. Given that I play in the back for one of my teams I found another novel use for the Totalcontrol system on the ball, pulling the ball away from attackers feet with a move resembling something that might be found in a rugby ruck. Despite my initial reservations of the FG/AG soleplate, I am a big fan of this version of it having used it for the last couple months. Another question I had was durability, I know Adidas spent a great deal of time testing these boots on all surfaces, but often times AG surfaces eat at FG boots (leather ones especially). Aside from some scuffing on the heel counter, the only durability issue I’ve had with them is there’s been a minute bit of separation on upper heel counter on the right boot. The leather still looks pristine and that’s usually what suffers under continual use on AG surfaces so well done to Adidas there, they’ve created a boot with quality durability. Can the Ace Leather Be Considered a Replacement for the 11pro? Of course it can. In my opinion it’s been designed in that vein right down to the colour scheme, which happens to resemble the initial colourway of the past couple of 11pro releases. However, it’s not the most recent 11pro which they remind me of, it’s the 2014 version 11pro’s. It’s all there, the more forgiving fit, the supple leather upper with stitching patterns across the forefoot for dimension, actually the only thing that’s missing is that the three stripes have been stitched onto the boot as opposed to being stitched into it. It reminds me so much of the 2014 11pro that I’ve been staggered to notice that when he occasionally turns out for New York City FC, Chelsea pensioner Frank Lampard has been sporting a pair of X 15.1 Leather’s as opposed to the natural successor to his beloved 11pro. 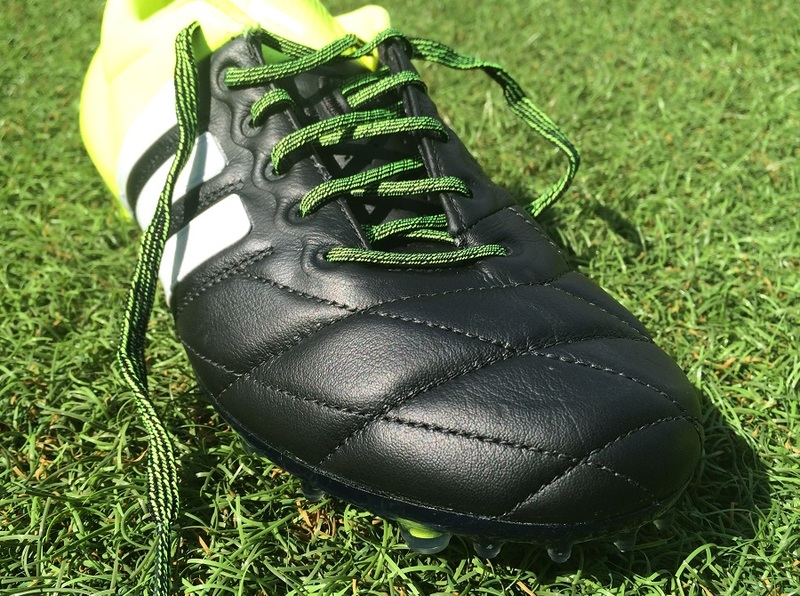 There’s not a whole lot that can be said badly about the Ace 15 Leather. I mean sure it’s not going to win any beauty contests for boots with it’s look, it reminds me a bit of a duck billed platypus, and the NSG coating on the rear of the boot is a bit naff. But what it is going to do is offer you a top quality boot if you want a K-Leather offering with an ultra modern twist to it. It’s definitely not a control boot release, but it’s also most definitely not a classic heritage offering. If you were going to pigeon hole the Ace Leather into a category you’d have to call it a Modern Heritage release. This is easily the most important question. The Ace Leather retails for an eye-watering $219.99, which represents a near 30% increase ($60) in price on the boot it was brought out to replace. The three pronged Adidas release (X, Ace, Messi) seems designed to fix (make the same) pricing across the top tier of all Adidas offerings, and as good a boot as I feel the Ace Leather is I know I couldn’t part with $220 (especially considering the Canadian dollars strength at the moment) for a pair, but then again I also don’t think that any boot should cost more than $200. Now if you were to tell me that the Ace Leather retailed for say $180, I’d be able to very comfortably say yes, I’d buy them and you definitely should too. Regardless of their overpricing, their technological overhaul means that they are closer value for money at their current price than the current Nike Tiempo Legend V; which wasn’t all that different from the Legend IV, but Nike somehow found a way to increase the price by $50. If you’re looking at picking up a pair of Adidas’ Ace boots you can find the entire collection, including new and exciting colorways at soccer.com. 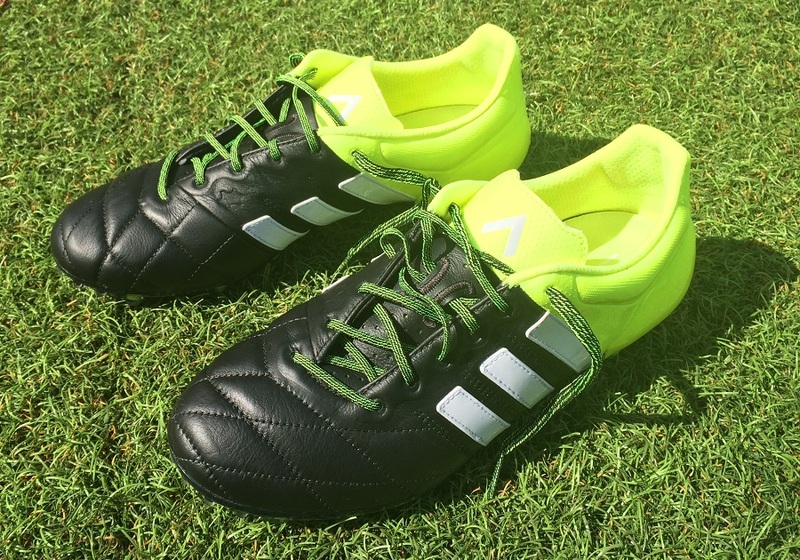 Have you had any experience with the Adidas Ace 15 Leather? Interested in trying it out? Agree or disagree with my opinion on the pricing structure of them? Leave a message in the comments. How do these fit, size wise, as compared to the Gloro 16?